This is a small application that creates an animation in AVI or GIF format from user selected images. 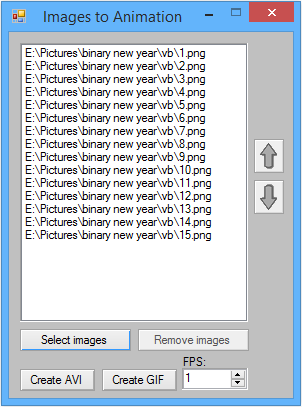 This functionality isn't possible in native VB.Net, but you can run the freeware program FFmpeg with the process class which produces video and GIF output from a contiguous sequence of numbered images. The imageUtilities class contains three static methods, one private and only used internally within the class. The two public methods are createGIF and createAVI. The image files chosen to be used in the animation or movie are copied locally and renamed in a sequentially numbered format that works with FFmpeg. This allows up to 100,000 frames to be used. The original image files are left intact in their original location. p.StartInfo.Arguments = "-f image2 -framerate " & fps & " -pattern_type sequence -start_number 0 -r " & fps & " -i images\frame%05d.png -vcodec mjpeg -qscale 1 output.avi"
FFmpeg - A complete, cross platform solution to record, convert and stream audio and video.